There are 25 operating Hydroelectric Power Plants on the Wisconsin River. The "hydros" harness 645 feet of the rivers fall to generate nearly one billion kilowatt hours of electricity a year - enough energy to supply the residential needs of over 300,000 people. The hydroplants are owned and operated by paper companies and public utilities. The height of the dams (also known as head) range from 12.5 feet at the Otter Rapids Station to 92 feet at the Grandfather Station. 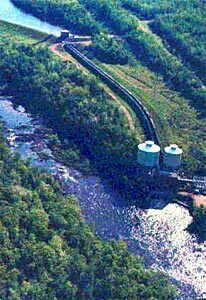 The generating capacity ranges from 700 kilowatts at the Otter Rapids Station to 29.5 megawatts at the Prairie du Sac Station. The reservoirs formed by the hydro dams range in size from only 200 acres at the Grandfather Station to over 21,000 acres at the Petenwell Station (making Petenwell the second largest lake in Wisconsin). The Grandfather Station, owned by Wisconsin Public Service Corporation and located between Merrill and Tomahawk along Highway 107, is shown on the right. Hydroelectric power is the worlds leading source of renewable energy. (1) Based on average annual residential electrical use of 3 mwh per person.